Beginning with our upcoming production of Fidelio, Seattle Opera will now offer live audio description of performances for patrons with visual impairments at select Sunday matinees throughout the 2012/13 season. Performances will be described at the 2 p.m. matinees on October 14, 2012 (Fidelio); January 13, 2013 (La Cenerentola); February 24, 2013 (La bohème); and May 12, 2013 (La voix humaine with Suor Angelica). This new service, provided at no additional cost to ticket-holders, is designed to enhance the opera-going experience for patrons by providing verbal information about the opera’s setting, scenery, costumes, onstage action, and more. Seattle Opera has worked in consultation with the Washington Council for the Blind and Arts and Visually Impaired Audiences to develop the program. Patrons can request an audio-description headset from the assistance booth, around the corner from coat check, located on the main entry level of McCaw Hall. Headsets will be distributed free of charge on a first-come, first-served basis. Participating patrons must leave an ID in exchange for the headset. A member of Seattle Opera’s Education staff will narrate the live description, beginning 10 minutes prior to the beginning of the matinee. The early start will allow patrons to become familiar and resolve any issues with their ear bud, while offering the narrator a chance to make introductory remarks about the production before the curtain rises. During the performance, descriptions will be carefully timed so as not to interfere with patrons’ enjoyment of the music, and will continue briefly at the beginning and conclusion of the intermission. Transmissions to ear buds will not disturb non-participating patrons sitting nearby. To find out more, contact the Seattle Opera Box Office at (206) 389-7676, or email tickets@seattleopera.org. Complete information about accessibility at Seattle Opera is available HERE. A great idea, provided, as indicated, that the narrative will not interfere with hearing the music!! 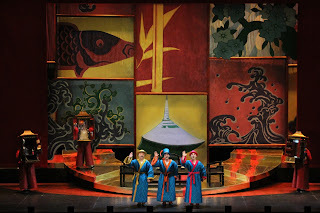 Although opera is a visual art form, as well as musical, it is first and foremost musical!! Toi, toi, toi for this novel experiment! Now visually impaired people can appreciate opera even more. Alongside ophthalmologist devices, engaging the other senses could increase the appreciation of an individual.